On June 21st, 2018 the Cannabis Act received Royal Assent and will come into force on October 17th, 2018, making Canada the second country to legalize the recreational use of cannabis nationwide after Uruguay. Navigating through the provincial and federal legislation can be difficult. 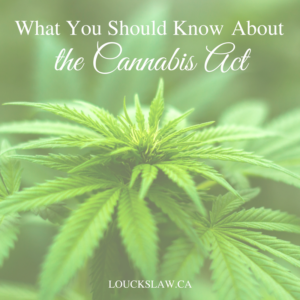 To help you Loucks & Loucks has prepared the following list of key things you should know about the new legislation. It should be noted the recreational use of cannabis remains illegal until October 17th, 2018. What is the Legal Age for Cannabis? In Ontario, you must be 19 and older to purchase, use possess, and grow recreational cannabis. What is the Possession Limit? You may possess up to the equivalent of 30 grams of dried cannabis in public. For more information on equivalent amounts of cannabis, please see Schedule 3 of the Cannabis Act. You may grow for personal use up to four cannabis plants per household. The plants must be grown from seeds or seedlings from licenced providers. Beginning on October 17th, 2018, adults will be able to purchase up to the equivalent of 30 grams of dried cannabis online from the Ontario Cannabis Store. You will be able to purchase dried or fresh cannabis, cannabis oil, cannabis seeds or cannabis plants. You will not be able to immediately purchase products such as edibles, but they will be legal within one year of the Cannabis Act being implemented. Currently, the Ontario Government is working on a plan for the private sale of cannabis. Check back here or the Loucks & Loucks Facebook page for more information once it is available. You will only be able to use cannabis in a private residence, including outdoor space. If you are living in an apartment or condo, you may use cannabis in your unit or on your balcony only if your building rules or lease agreement permit you to do so. Cannabis may not be used in any public space, workplace, or motorized vehicle. Use of cannabis in a public space can result in a fine of up to $1,000.00 for a first-time offence and up to $5,000.00 for subsequent offences. What Are Cannabis Related Offences? Possession, production, and distribution of cannabis outside the legal system will be subject to legal penalties. The penalties range from ticketing to 14 years imprisonment and the sentence will be proportionate to the seriousness of the offence. Once the Cannabis Act is implemented, the Canadian border rules will not change. Whether you are entering or exiting Canada, it will remain illegal to bring cannabis across the Canadian border. How Will the Cannabis Act Protect Youths? In efforts to protect youths, the Cannabis Act created two new criminal offences. It will be illegal to give or sell cannabis to a minor and to use a youth to commit a cannabis-related offence. These new offences each carry a maximum penalty of 14 years imprisonment. Youths who contravene the act may be prosecuted under the Youth Criminal Justice Act or may be referred by police or the prosecution to participate in an approved youth education or prevention program. A young person will not be prosecuted for possessing or sharing a very small amount (up to 5 grams) of cannabis. Can I Drive After I’ve Taken Cannabis? It remains an offence to drive while impaired by cannabis. You may not drive with any amount of cannabis in your system if you are 21 and under, a holder of a G1, G2, M1, or M2 licence, if you are driving a vehicle that requires an A-F license or Commercial Vehicle Operator’s Registration, or you are driving a road-building machine. Once an oral screening device is federally approved, it is anticipated it will be used in Ontario to assist police officers with roadside screenings. We will be following the Cannabis Act and changes to the legislation closely. Be sure to check back here or the Loucks & Loucks Facebook page for more information once it is available. ← New Grey Bruce Legal website released + Facebook page!